Music is an intricate component to the Mega Man franchise. The convergence of different sounds and instruments has produced some of the most memorable soundtracks in gaming history. Ruby-Spear certainly took that to heart when setting out to adapt the series for animation; their efforts culminating in a generally interesting musical score (with a rad theme song to boot). Unfortunately, the score never quite got the album treatment it deserved. Destructoid's Tony Ponce takes us on a trip back to the 90's to explore the insanely offbeat Mega Man cartoon albums that, essentially, have very little in common with the show. 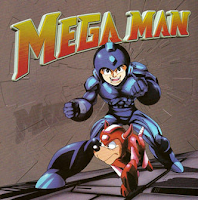 The soundtracks, both released in 1996, were a dumping ground of Mega Man-inspired thrash songs, tasteless hip-hop, and amateur metal bands. Today, the soundtracks are a great commentary on record labels trying to cash in on a popular name. Posted on the Offbeat Hall of Fame you'll find a detailed analysis on both disks, along with (gulp) samples. The contents are just so bizarre, trippy even, that I'm almost certain Capcom/Ruby-Spears regrets ever licensing it. Those brave enough to learn more can head on down to the Offbeat Hall of Fame. Huge nostalgia trip right there. You know, the soundtrack CD with the stuff like Skid Row and Sugar Ray is actually mostly quite good. I've always felt that this album gets ignored and is sadly forgotten. It introduced me to some pretty damn awesome bands like Machines Of Loving Grace so I think its worth a listen. This was a fairly common practice back then, easy way for record companies to move D list bands. Then again, I didn't listen to it for the very reason that it had nothing really do do with the show. I'd love to see a true score album come out, though. I enjoy some of the tracks on this album to be honest. Take Cover by Mr. Big is very nice. Always reminds me of Mega X though. That and the 90's in general. Where the hell did the 90's go. I liked this CD too. Not what I was expecting, but still interesting. The 90's are still in effect (if you're talking 1997+), they've just slashed budgets, abolished creativity and gave everyone little gadgets to distract them from the downward spiral. As oddball and unrelated to Mega Man as it is, I do love this CD. Take Cover is my favourite track, I think. My dad and sister and I were at Wal-Mart wayyyy back and found this. We had no idea it even existed. Of course, we bought it. I remember telling Mandi Paugh about the Junior Mafia track and how they censored it. I believe she was like "...WHY would they put a RAP SONG on there and then censor it?! How does that relate to Mega Man anyway!?" I think it was meant to be a theme for Wily's crew, IMHO.. but that's just me. I've been meaning to rip my copy for a while now. email me (using the email listed in my profile) and I'll hook you up.